Genesis', "Broadway Melody of 1974"
"Carry that Weight" and "Helter Skelter", both by the Beatles. An indirect reference to "Everyone's got Something to Hide ('cept for Me and my Monkey)" also seems to be there. 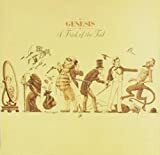 Genesis mention their own song, "In Too Deep."